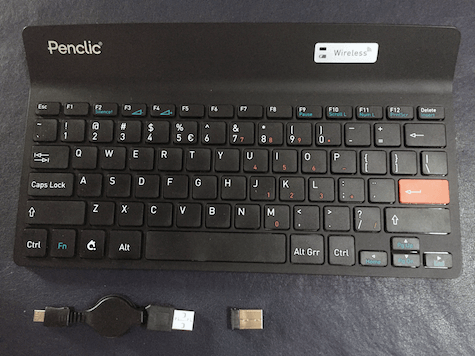 The Penclic Mini Keyboard K2 is a wireless keyboard the size of Apple’s smallest Bluetooth keyboard. The K2 is wireless but it is not a Bluetooth keyboard. It comes with two rechargeable batteries and a tiny device (or dongle) that plugs into a USB port and enables the keyboard to communicate with a Mac or PC without the interference of wires. The K2 is slim even when its two plastic feet are extended to enable a better angle for typing. This wireless keyboard, a product from Sweden, has three main attributes. It’s light weight, has a compact design and has comfortably responsive keys. The downside is that the K2 isn’t really designed with Mac users in mind. The key where the Command key should be simply bears Penclic’s logo with two horizontal lines through it. Once you figure that out, you have to wonder what it does. It turns out it functions as the Command key. But like much else on this keyboard, you have to guess about what does what. The Pencil’s website is filled with gibberish about the keyboard’s ergonomics and health benefits but precious little about specific features. 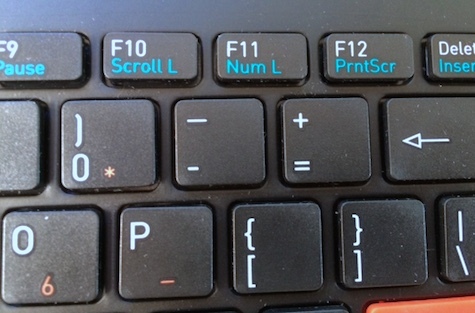 One example: There’s a key at the bottom right side of the keyboard marked Alt-Grr. Such a key may be known widely in Europe, though typically with one “r”, as the one to use when entering special symbols like a tilde or the British pound sign. But I suspect most American consumers will be perplexed, No explanation is available in the pamphlet that comes with the keyboard to explain several features that will be unknown to many consumers. 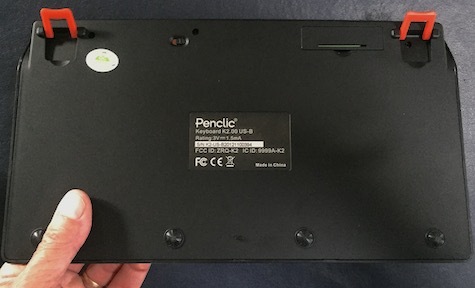 The Penclic K2 Keyboard seems gimmicky and needlessly confusing. It’s offered at a price that is not competitive with similar keyboards. MyMac Review Rating is 5 out of 10.